Father’s Day weekend this year was a rainy and gray one. The water came in a nearly unending stream and the wooly clouds parked overhead and didn’t budge. I’d had a book signing at Wy’East Book Shoppe & Art Gallery in Welches that Friday night — the last sign of sunshine for a few days — but rather than head back home afterwards, we decided to make a weekend out of it. We did so in a Steiner cabin up in Government Camp, thanks to some very generous friends who were lucky enough to come across one of these unique little getaways a few years ago. 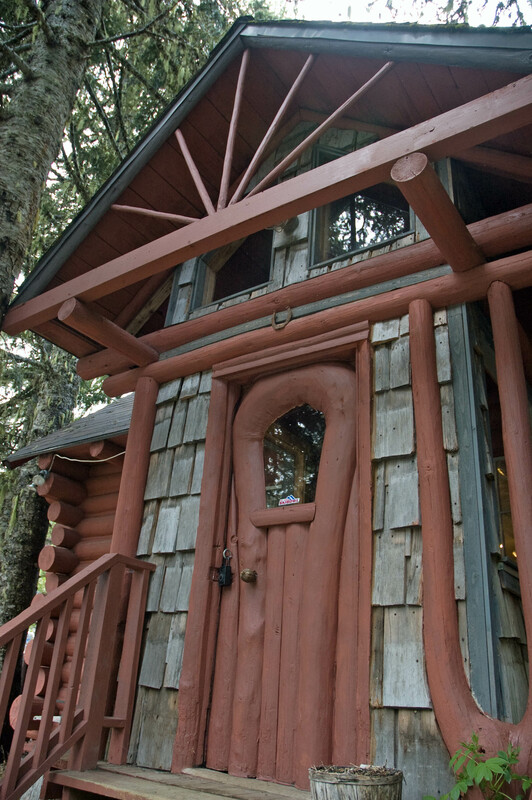 One of the most unique features of many of the 30 or so cabins sprinkled between Rhododendron and Government Camp are snow-bent timbers that the Steiners used for rounded doors and other architectural elements. 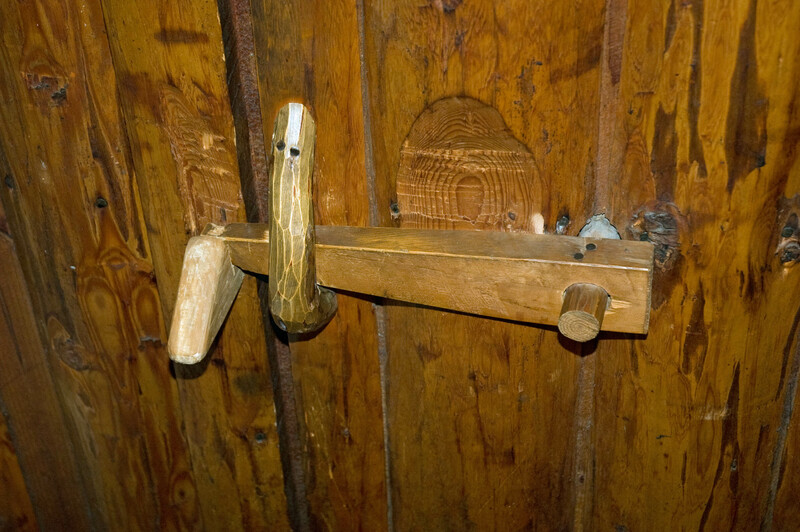 The Steiners also fashioned natural, functional accents for their cabins, using burls from trees for doorknobs and hand-carving pegs and lever mechanisms to open and close doors and windows. The weekend we stayed in a Steiner, raindrops slid off the overhead boughs outside and a crystalline stream gushed without end. An ugly mist kept us from venturing out beyond a few trips to the general store and a quick jaunt up to Timberline Lodge for an afternoon outing. 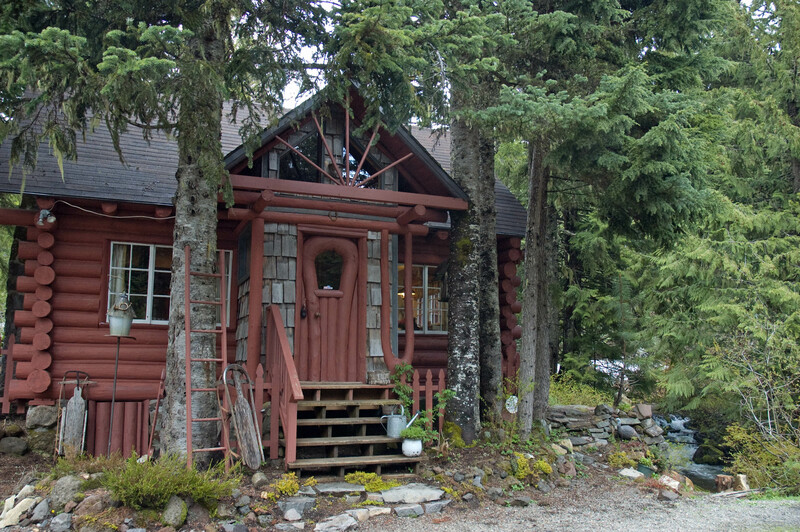 Inside the cabin, the rustic smell of woodsmoke permeated the timbers in a welcoming way. A fire in the stone fireplace added warmth and a glow to the room. We stayed close inside the Steiner for nearly two days straight, and it was just right. This entry was posted on July 12, 2011 by onmounthood. It was filed under Lodging .